According to Madhuli Devi (30) from Nainital’s Bindukhatta, the news of farmer protests in Maharashtra, Delhi and Ghazipur this year has inspired women to participate in this march. A labourer at a paddy field, she earns a few kilos of rice every month, and the quantity reduces if she’s late. “We want our own land, to cultivate our own rice, to be paid for our labour in cash. But as a woman, I want a toilet to be built near my house,” said Devi. 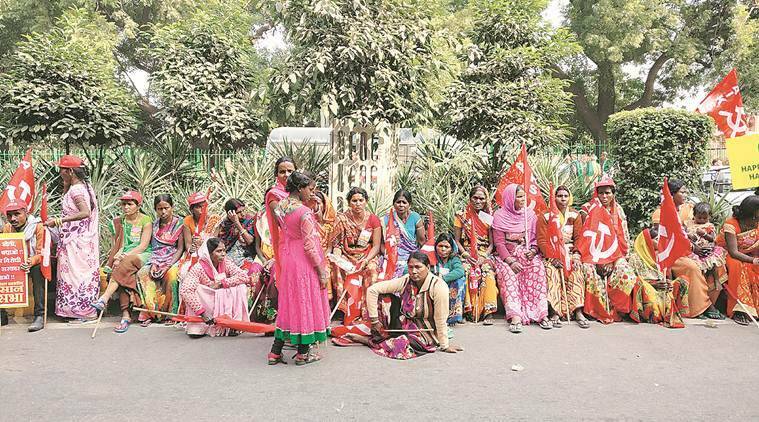 “Mahila ke sahyog bina har badlaav adhura hai… bhumi putr toh hai hi, ab bhumi putriyon ki baari,” said Kamla Yadav (60), who came from Barwani district in Madhya Pradesh. Yadav is a cotton farmer and this is the first protest she has participated in. “Women take care of their home, children, fields. Land is not registered in our names, women labourers are not paid enough, we don’t get pension. If the crop is damaged, we face the wrath of our husbands. If we have equal ownership of land on paper, we will feel more secure,” she said. “I remember watching visuals of very old women walking from Nasik to Mumbai. I realised, if they can fight for visibility, so can I. We are farmers too, and we want minimum wage to implemented on fields so we earn as much as men,” she said. Perhaps it is the incessant protests that have resulted in the turnout — with many travelling without men from their families. Pushpa (35) from UP’s Isa Nagar has left her husband behind to take care of their two daughters. “I just want my daughters to be educated. We don’t have land to till or our own house. We work on other people’s fields and I want minimum wage to be implemented for my husband as well as for me,” she said. From UP’s Bijnor came 80-year-old Nafisa, hoping to get her land back from a local politician, while Tara Meher (75) from Odisha’s Sambalpur sought compensation for her crop damaged by chikada, an insect. Gurdwaras in central Delhi pitched in for farmers with food and shelter. Sikh Gurudwara Prabandhak Committee officials said farmers stayed in Gurudwara Bangla Sahib and Gurudwara Rakab Ganj overnight on Thursday. SGPC general secretary and BJP-SAD MLA Majinder Sirsa said food was sent from Bangla Sahib to Ramlila Maidan Thursday. “On Friday, we sent food at Jantar Mantar,” he said, adding that food was sent for more than 25,000 people.